Explore the best of Myanmar, known as “The Golden Land,” on this captivating river cruise along the Irrawaddy River. In Yangon, formerly Rangoon, you’ll see the magnificent, gilded Shwedagon Pagoda—considered the oldest pagoda in the world. Your river cruise will get underway in dramatic fashion as you sail along the untouched upper Irrawaddy and pass through the second defile with its magnificent cliffs. Visit remote villages for fascinating interactions with schoolchildren, nuns, monks, and pottery makers. 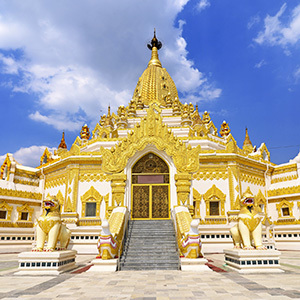 In the exciting city of Mandalay, be inspired by a visit to the revered shrine of Mahamuni Pagoda with its impressive gold-leaf Buddha and enjoy a traditional dance by local performers. Feel the unique energy of the people on a walking tour through the village of Shwe Pyi Thar as you interact with locals and see the daily work done at a farmer’s home. 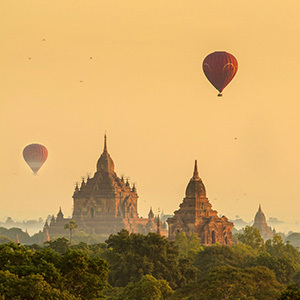 Bagan, a medieval capital of Myanmar, with thousands of historical structures still standing, is one of the world’s greatest archaeological sites. Visit one of the many spiritual temples at sunrise and a local market selling the unique handicrafts of the region. The tranquil Inle Lake is a beautiful area surrounded by mountains with stilted houses dotting the shorelines. You will explore this area, stopping in Silk, Silversmith, and Cheroot Workshops, and attend a traditional song and dance performance by the Padaung long-necked women who live in this part of Myanmar. 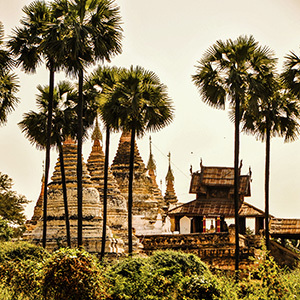 This river cruise vacation along the Irrawaddy offers everything from peaceful sailing and alluring scenery to grand, majestic temples and shrines and plenty of interaction with locals to learn and feel a part of the ancient culture. More than just a river cruise—an unforgettable adventure! Welcome to Yangon, formerly known as Rangoon, the country’s largest city and former capital. Hotel rooms are available for mid-afternoon check-in. A Guided Walk introduces you to the city’s famous and historic landmarks, including old colonial buildings and Sule Pagoda, built during the time of Buddha. Along the way, stop for a cup of tea or coffee with the locals. 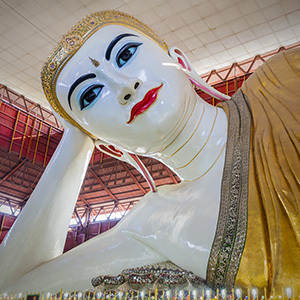 Next, stop at Chaukhtatgyi to see the massive Reclining Buddha measuring 213 feet. Later in the day, visit Shwedagon Pagoda, a national symbol. Here, an enchanting scene unfolds as the sun sets on the golden stupa, and locals come to pay their respects. Tonight, your welcome dinner is in one of Yangon’s best restaurants. Late in the morning, fly to Bhamo. Upon arrival explore Bhamo by local trishaw and by foot, then transfer to the port for embarkation. This afternoon, spend time at leisure as you sail through the dramatic Second Defile with its magnificent cliffs reaching down the narrow channel. A welcome reception starts your evening. Explore the island village of Kyun Daw, where over 7,000 stupas surround the monastery. Your Guided Excursion includes a visit to a fisherman’s home and a school where you will interact with the children. You will also visit a nunnery to present the nuns with food purchased the day before at the market in Katha. Unlike monks, they have to collect and cook their own food. DISCOVER Enjoy time onboard your ship this afternoon. Join your Local Guide for a presentation on the Burmese language. As you sail south, with some luck, you may catch a glimpse of the rare Irrawaddy dolphin, with its distinctive round forehead. DISCOVER Start your morning Guided Sightseeing tour at the local wet market, where you will see locals buying and selling fish, meat, and produce, and more. Next, learn more about life during British rule at the former British Club, featured in George Orwell’s novel, “Burmese Days.” Lastly, meet with the Jingpo, one of over 100 ethnic minority groups in Myanmar. Here, you will learn about their culture, traditional dress, and unique method of making rice wine. Take the normal Walking Tour but make the steep climb up to the Reclining Buddha. Interact with the monks at a Monastery Visit in Kya Hnyat. This is a truly memorable experience as you present alms to the monks and witness their lunch ritual. Join your Local Guide for a longyi and thanaka presentation this afternoon. This morning, join a Guided Walk through the captivating pottery-making village of Kyauk Myaung to learn more about and see the pottery-making process. Most interesting is the eye-catching 50-gallon variety, often referred to as Martaban or Ali Baba jars. These pots could transport large quantities of goods and have played an important part of maritime trade throughout Asia for centuries. Enjoy time onboard your ship this afternoon. This afternoon, travel to nearby Amarapura, former capital of Myanmar. Your Escorted Visit focuses on the famous U Bein Bridge, a 3/₄-mile-long bridge built in 1783 from reclaimed teakwood from the old royal palace in Inwa. Take a sampan ride on the lake for memorable views of the sunset. In the morning, join a Guided Visit to local workshops to see skilled artisans at work making tapestries, woodcarvings, and gold-leaf. 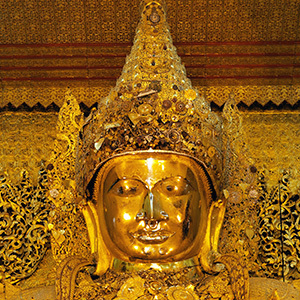 Lastly, visit Mahamuni Pagoda to see its impressive gold-leaf Buddha. Due to the continual application of gold leaves, officials note the gold is six inches thick! This afternoon, visit Kuthodaw Pagoda and Shwenandaw Monastery, the only remnants of former King Mindon’s “Golden City” to survive the bombing of World War II. Today, the original gilding has faded, but the intricate wood carvings endure. This evening, enjoy a traditional Dance Performance featuring local song and dance. 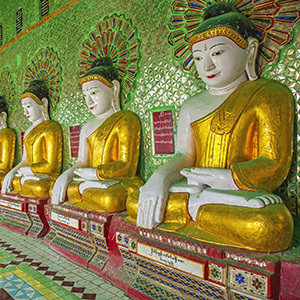 Enjoy a Morning Visit to Sagaing with countless pagodas dotting the hillside. Stop to see Kaunghmudaw Pagoda with its unique egg-shaped dome and a silversmith workshop. 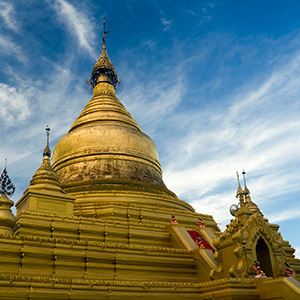 Lastly, explore Soon U Ponya Shin Pagoda for stunning views across the Irrawaddy to Mandalay. Enjoy time onboard your ship this morning. This afternoon, partake in a Walking Tour through Shwe Pyi Thar village. Here, visit a farmer’s home to learn more about daily life and see the locals making palm candy. After the sap is collected, it is cooked in an iron pan over an open wood fire until it thickens and can be formed into small pieces by hand. After dinner, a traditional Puppet Show will be presented in one of the lounges. 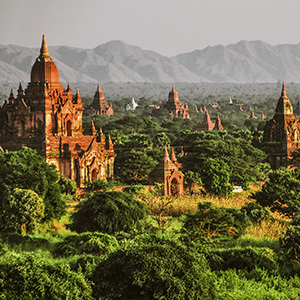 Today, explore Bagan, one of the world’s greatest archaeological sites. 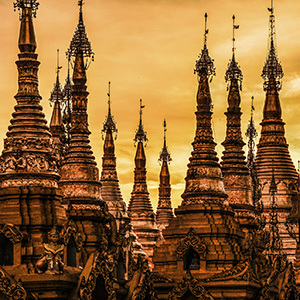 From the 9th to the 13th centuries over 13,000 temples, monasteries, and pagodas were built in the plains surrounding the city—an area of about 40 square miles. Many of these structures have been lost over time, but around 2,300 still stand today. Early risers can visit one of the temples with a Local Guide to witness the sunrise. Start your Morning Excursion at a local market selling handicrafts, fabrics, and longyis. Then, stop at Shwezigon Pagoda, one of the country’s most important shrines. Lastly, visit a lacquer workshop to learn more about this ancient craft. 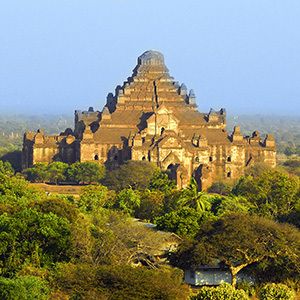 After lunch, your Guided Sightseeing centers on the Bagan archaeological zone. Highlights include Ananda, considered by many to be the most beautiful temple, and Dhammayangyi, the best preserved monument left standing. Also, stop to see the exquisite and well-preserved fresco paintings at Sulamani. End the day with an Ox-Cart Ride to a temple, where you will ascend to the top as the sun sets. 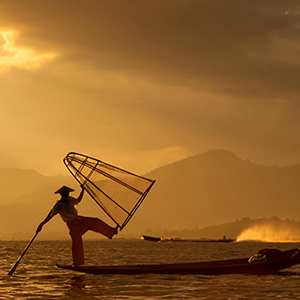 Transfer to the airport and fly to Heho, gateway to Inle Lake, a tranquil body of water surrounded by mountains. Pause at Red Mountain Estate to bask in the beautiful scenery as you enjoy a lunch of authentic fare and wine produced from the vineyards here. Continue to your lakeside resort, where you will spend the next two nights. Today, join a fascinating Guided Excursion to see scenes of life around the lake. Stilted houses dot the shorelines, and the local Intha people use the famous one-legged rowing technique to fish and tend their floating gardens of tomatoes, cucumbers, aubergine, and more. These clever gardens are made from weeds lashed together and mud from the lake bottom, then anchored using bamboo poles, allowing them to rise and fall with the water level of the lake. Along the way, stop at a silk workshop, where they use the fibers of the lotus plant to weave garments. You will also visit a silversmith workshop and a cheroot workshop, where young girls roll the cigars at a dizzying pace. Before dinner, attend a music and dance performance by the Padaung long-necked women who live in this part of the country. Today, transfer to Heho for your flight back to Yangon for an overnight stay. Your extension ends with breakfast this morning. 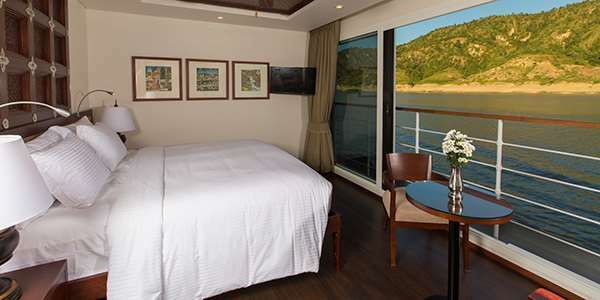 One of our remarkable Suite Ships®, the all-suite Avalon Myanmar offers an unrivaled small-ship river cruise experience ensuring you engage the locals, experience their culture, and revel in the unique sights along the majestic Irrawaddy. 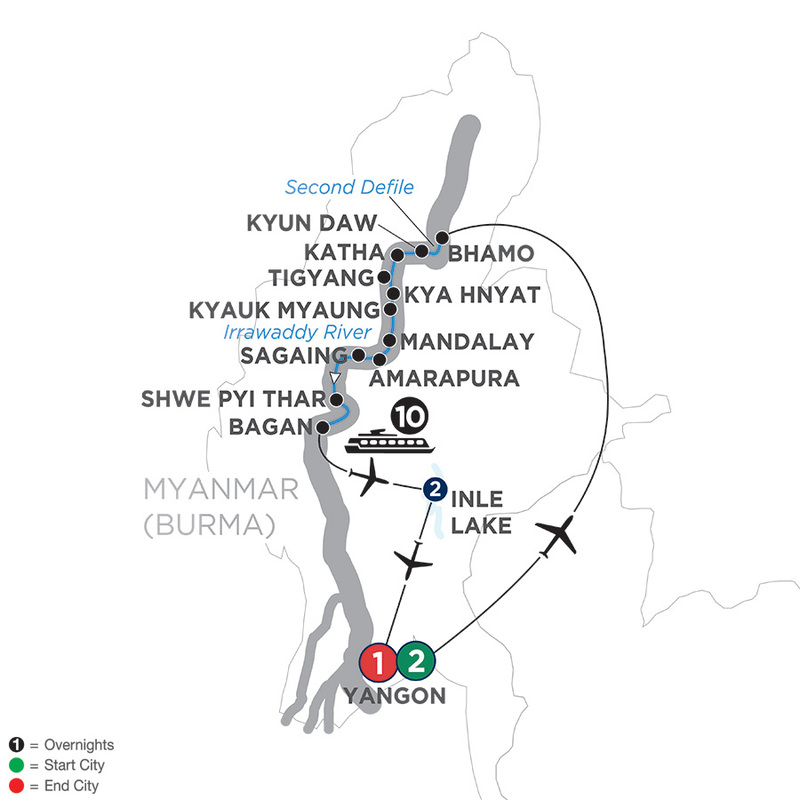 The pioneering design allows Avalon to cruise the spectacular, and untouched Upper Irrawaddy on each departure, a feat not possible on any other ship. The ship has been meticulously crafted to offer all the modern features you expect, yet it reflects the character, symbols, and traditions of Myanmar. 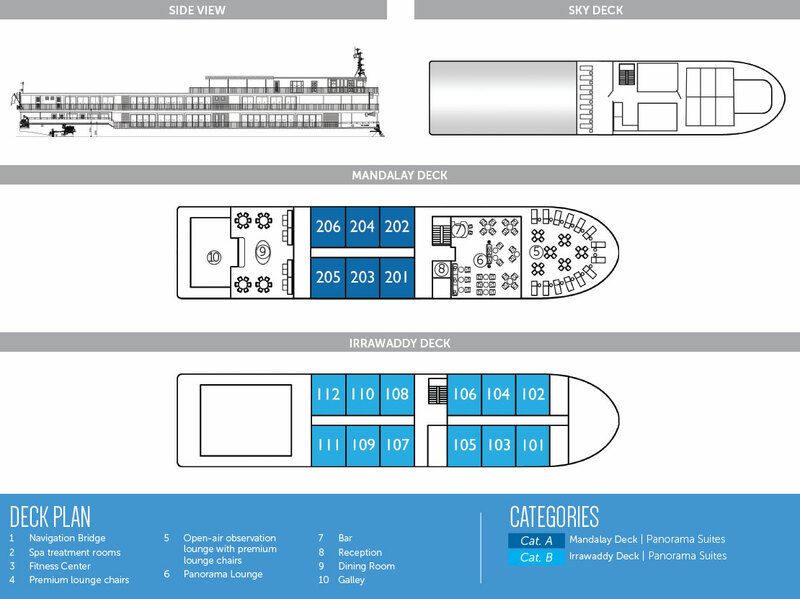 While the maximum number of guests on the ship may be small, the ship isn't. Built as long and wide as other ships that carry twice as many guests, the public spaces never feel congested. From the open-air observation lounge to the air-conditioned Panorama Lounge, there is plenty of seating and places to relax. Plus, our lounges are located at the front of the ship, not the back, so no matter where you sit, you'll always have a great view. Our crew embodies the spirt of you first, no matter what. From the reception staff and bartender to wait staff and room attendant, we always deliver exquisite service that's comfortable and friendly, never stuffy! 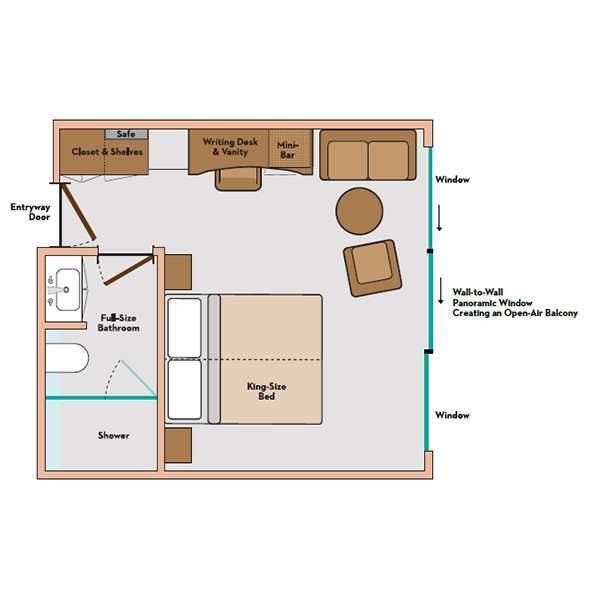 With Avalon, our ship becomes your home away from home. Category A & B - 245 sq. ft.